Sending Christmas wishes from the goat pen. I’m sure I’ll be fine in time, but right now is there anything I can do for Pasqualina to make sure she doesn’t fall ill from all the sudden changes? A heartfelt good-bye to one of the best goats who ever lived. Pinta seems to have a cold. Or at least I hope it’s just a cold. Help goatie experts! 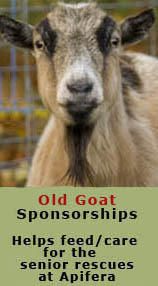 A list of goat and donkey charities and rescues for your donating pleasure. If all goes well, kids in the spring! Meet the buck who can make it all possible.